After accidentally ploughing open a mouse’s nest more than two centuries ago, Robbie Burns was moved to write “To a Mouse,” an anthropomorphic apology for the creature’s suffering. Now science is affirming Burns’ peculiar instincts: it turns out mice really do have feelings. Well, at least for each other. McGill psychology professor Jeffrey Mogil recently discovered mice recognize—and react to—pain in their peers. Called “emotional contagion,” the phenomenon is suspected to exist in several primate species. 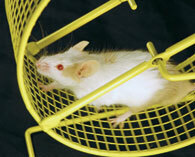 After injecting two mice with a solution that caused a 30-minute stomach ache, Mogil observed that both mice responded with more pain behaviours than mice tested alone. Mogil repeated the experiment, but blocked the mice’s view of each other, abolishing the effect. Watching a buddy suffer also seemed to prime the pain pump. When Mogil heated a glass floor beneath their feet, mice exposed to a distressed cagemate reacted much faster than mice whose roomies were in better shape. Jeffrey Mogil is the Canada Research Chair in the Genetics of Pain and E.P. Taylor Professor of Pain Studies. His research is funded by the U.S. National Institutes of Health, the Canada Foundation for Innovation and NeuroScience Canada.